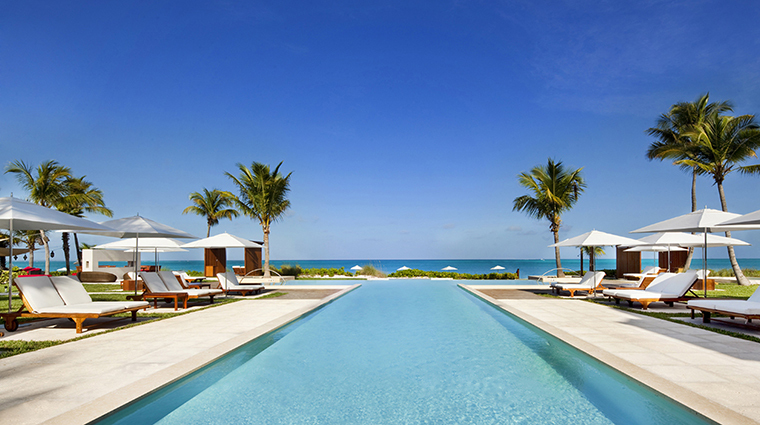 When envisioning Turks and Caicos, you daydream of Grace Bay Club, without even knowing it. You imagine frolicking on its 11 acres of white-sand beach, sunning at its three pools, sipping cocktails at a striking 90-foot infinity bar that seems to disappear into the ocean and whiling away the day in an oceanfront room as your complimentary personal concierge (whom you can call 24 hours a day via a provided cell phone) arranges an itinerary of adventures on land (time on the hotel’s own two tennis courts and the nearby Provo Golf Club) and sea (sailing, deep-sea fishing and kayaking). 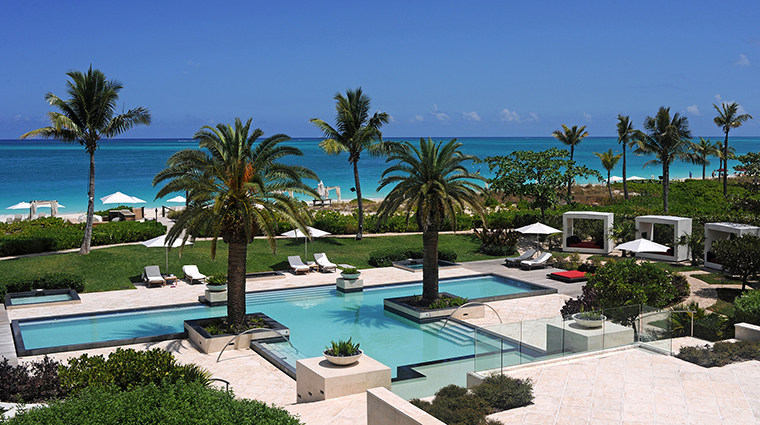 Grace Bay Club was the first luxury all-suite resort in Turks and Caicos. 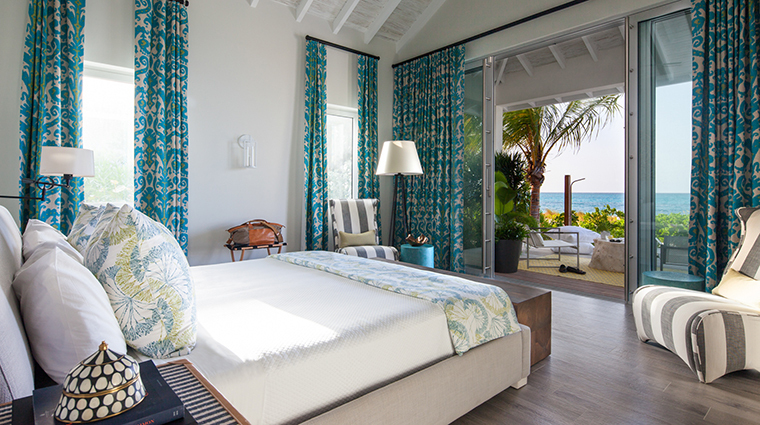 Located in Providenciales, the largest island in the small Caribbean country, the beachfront property includes an adults-only hotel and family-friendly one- to three-bedroom Villas Suites. If you need some respite from all of the water activities, retreat to Grace Bay Club’s Anani Spa (Anani is an ancient Lucayan word for “water flower”). There, you’ll find six treatment rooms, a tent for beachfront massages, a steam room and an outdoor swimming pool. Be sure to grab a drink at the 90-foot-long Infiniti Bar, the longest bar in the Caribbean and the first- infinity-edge bar in the world. The hot spot features tapas and delightful tipples. Parents will want to sign up children for Grace Bay Club’s Kids Town, which provides supervised activities such as beach-combing and building sandcastles. While there are plenty of activities for adults, you can’t beat the long sweeps of white-sand beaches and the startlingly clear turquoise waters. 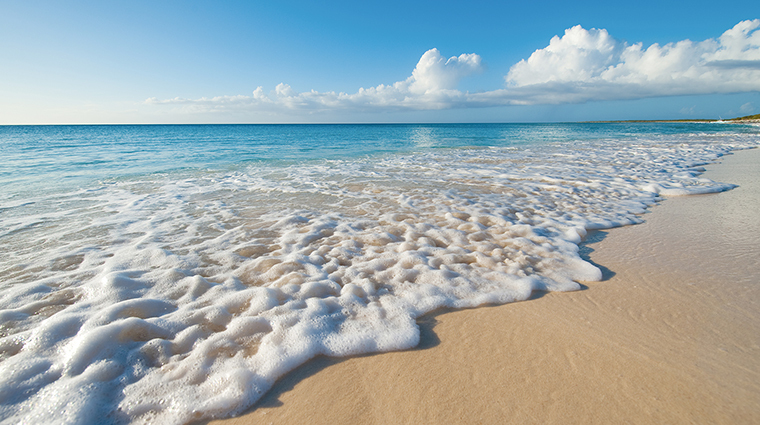 Part of Turks and Caicos’ Princess Alexandra National Park, Grace Bay Beach ensures maximum relaxation (most motorized watercraft are banned), especially if you’re lounging on a canopied daybed. Kids Town, the resort’s club for children, also takes little ones on excursions, including eco-tours, marine reserve visits, cave safaris and scuba lessons. Couples seeking a romantic escape will want to check into the adults-only hotel. It provides a range of accommodations, from 1,080-square-foot junior suites to 2,200-square-foot two-bedroom suites. Each room at the hotel has an oceanfront private balcony or patio, along with a kitchenette. Plus, you can avoid the families in the other areas of the resort in the adults-only pool and restaurant. 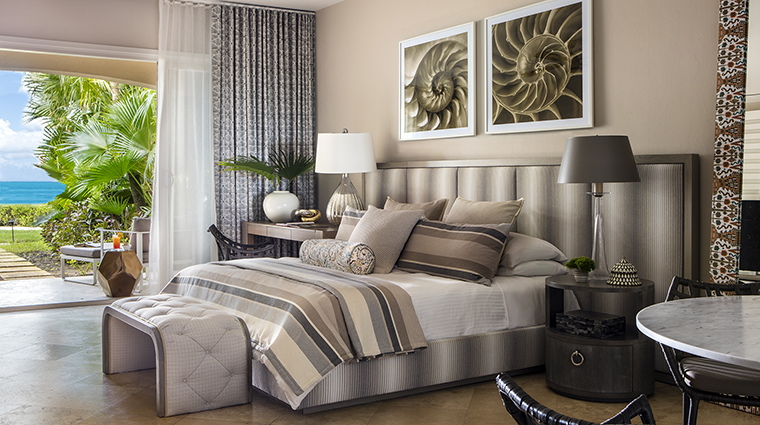 Grace Bay Club’s Villas Suites give you ocean vistas and 600 to 6,340 square feet of living space. All of these suites are located in four five-story, Mediterranean-style buildings with only two suites per floor. Whether you stay at the hotel, the villas or the Estate, rest assured that all suites have ocean views, fridges with ice makers, Egyptian cotton linens, featherbeds and bathrobes. 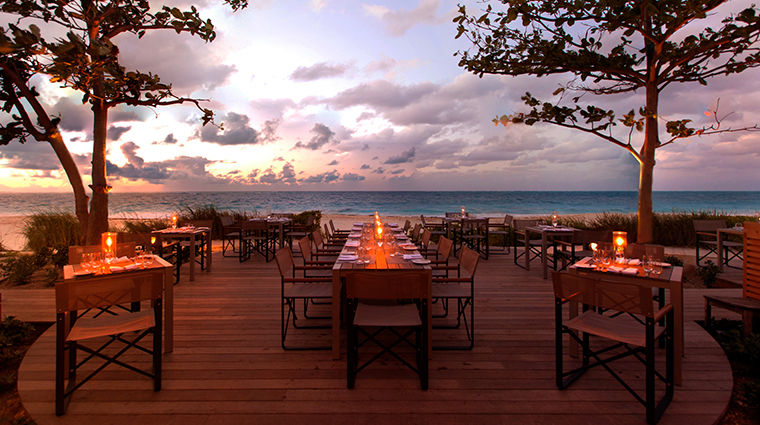 Savor the waterfront scenery in the open-air Infiniti restaurant. Enjoy European-Caribbean fare like potato gnocchi with shrimp and tomato ragout or spiny lobster with grilled asparagus, potatoes and charred lemon. The restaurant also offers wine-and-food pairings and tasting menus such as the ocean-themed option with mussels, clams, tiger shrimp, squid and diver scallops. 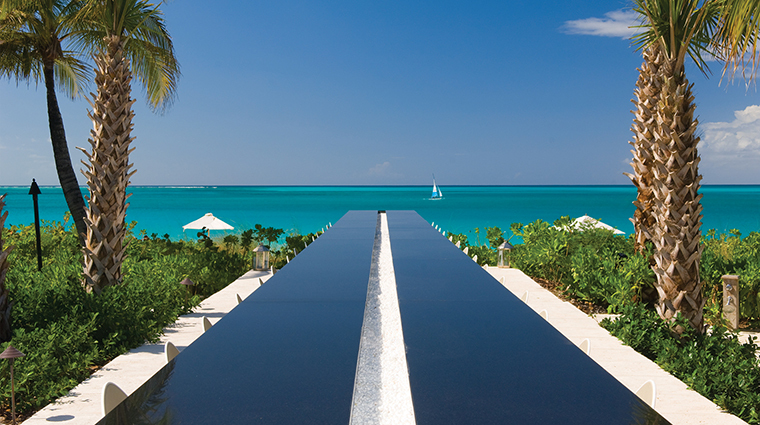 The Turks and Caicos resort also has The Grill with bistro-style seating by the ocean serving breakfast and lunch — try the conch soup with rosemary croutons — and several bars. For a sampling of authentic Caribbean dishes (Jamaica pepper pot soup, stewed conch and mango-and-coconut layer cake), make a reservation for Grace Bay Club’s barbecue hosted on the beach Thursday evenings. A fun option in Grace Bay Club’s dining scene is Stix, the hotel’s newest bar concept. Serving refreshing beers and rosé wine, this beachy, casual spot features tapas-inspired finger foods like bacon-wrapped potatoes and lobster cocktail on skewers.